Felice offers professional packing services to assist you with your packing needs. We also sell all packing supplies, new or used, at both locations. Local moves are performed by the hour within a 40 mile radius. 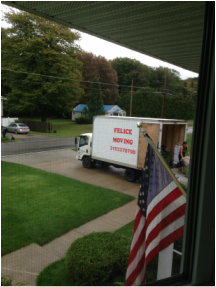 Felice moves household goods and office furniture. Our intrastate rates and regulations are filed with the Offices of the Department of Transportation, New York State. Our Tariff, No. Mt No. I Case T-1069, is available for inspection in our offices. With our interline agreement with Wheaton World Wide Moving, we will haul your household goods on our own trucks from New York State to up and down the east coast to South Carolina. All other moves will be hauled by Wheaton World Wide Moving.